Few years ago, Kingfisher suffered a financial crisis and had to shut down and these days SpiceJet is in news for a similar risk. Here we delve into the cause and effect behind it through Astrology & Numerology……..
Astrologically, Colors play a vital role in our lives. Not only do they affect our personality but also have a direct correlation with our efficiency and thereby affecting our destiny indirectly. The logo or the color theme of a brand can similarly affect its profitability and longevity. Aviation industry is governed by the effect of Saturn & Venus in Astrology. Blue & Black are the colors favorable for Saturn related businesses and White is the lucky color for Venus related trades. Even though the trade is primarily under the influence of planet Saturn we consider Venus signifies and affects the Luxury Airliners and the elite class business in this industry. As a matter of fact, the List of top 20 Airlines (As per worldairlineawards.com) includes the names of more than 85% airlines with their logo in shades of blue and black. Some airlines use other colors as well but the colors blue and black are dominant in their color theme (Only the Swiss Airlines is an exception in this case as is logo is red too). Is there a similarity between the failures of these two Airline giants? 3. Both rose to the heights of success and fame and then suddenly declined ! By 2008, Spicejet was India's second-largest low-cost carrier in terms of market share. 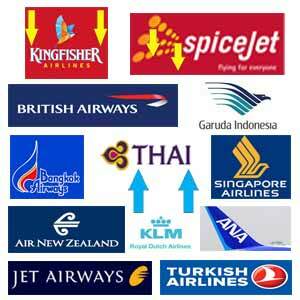 In June 2010, Spice Jet was the most profitable airlines in India when it got a new owner Mr. Kalanidhi Maran. In my prediction given in June 2012 in The times of India, I had predicted a Dooms Day ahead for Kingfisherif Red Continues to be their color in logo and in their theme.